War has been compared to an art, to science, to commerce, and sport. These are metaphors, and as such all may have their uses, but a little-known section of Thomas Aquinas’ massive Summa Theologica posits what is possibly the richest and most accurate characterization of command in war, that it is an act of moral prudence. The short discussion of moral prudence that follows owes a large debt to Dr. Gregory Reichberg’s recent Thomas Aquinas on War and Peace. Additionally, current events appear to give the military application of prudence considerable immediacy. In his typical interrogatory style, Aquinas begins by asking, “Whether military prudence should be reckoned a part of prudence?” He notes three objections. First, that warfare is an art, which (citing Aristotle) is distinct from prudence. Second, that although military affairs come under politics, so do other matters, such as trade, which are not of prudence. Third, that soldiers have need of fortitude rather than prudence. To revive this idea for modern readers, a few words of translation are necessary. Prudence, prudentia, meant more to the ancients and later writers in Latin than it does to modern English-speakers. Latin is closer to its origins and more understood as imbued with moral values than are modern languages. The lives of the ancients were moral tests and tasks, like the labors of Hercules. Today in common use prudence is almost synonymous with caution. When we pair it with moral, it is to emphasize its status as more than mere caution, and as a moral as well as an intellectual virtue. When we speak of military prudence, we are assuming a prudence that has already accepted the unavoidable hazards and mischances of war. It is in fact these very elements of armed conflict that make moral prudence perhaps the sine qua non of the exercise of military leadership and command. Aquinas poses a general answer to the objections to military prudence in addition to individually addressing the three objections. He acknowledges that war has aspects of art, as in the use of “external things, such as arms and horses,” but that, as it pertains to the public good, it belongs to prudence. His argument against the second objection also invokes the common good as an aim in warfare that relates it to prudence. Thirdly, Aquinas says the direction of war requires prudence as well as fortitude. As noted by Reichberg, the arguments of Aquinas concerning war and prudence have been neglected, eclipsed by other descriptions and metaphors for how soldiers think. The officer who thinks as an artist or scientist, even if subject to law, but who lacks the virtue of military prudence, is more likely than the prudent commander to confuse ends and means, to act in a short-sighted way, or to surrender to expediency. Art is concerned with things to be made, prudence with things to be done. Art—and also science, craft, business, or sport—do not require complete virtue in a person, but prudence does. Prudence is a thick conception of virtue that calls for character plus skill. Further, the truly prudential commander would not seek victory alone, nor a narrow national interest, but a common good. Aquinas’ identification of military prudence accords with his precepts on just war. 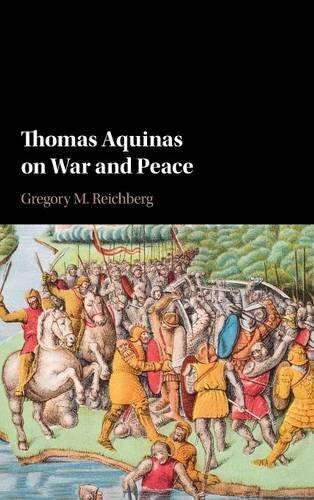 Aquinas is concerned with just or sufficient causes for war and with proper restraint in war. Just as skill is not enough for the true excellence in a commander, justice and law are not enough to limit conflict and secure a moral order among nations. There must be amity as well. The officer who thinks as an artist or scientist, even if subject to law, but who lacks the virtue of military prudence, is more likely than the prudent commander to confuse ends and means, to act in a short-sighted way, or to surrender to expediency. Since prudence is both a moral and an intellectual virtue, the principle of the golden mean, of navigating between extremes is given emphasis. Few have greater need for this principle than the military commander, who is constantly performing a balancing act between undesirable courses and outcomes. In military operations, the apparently better course of action is often the lesser, since it will be too obvious and anticipated by the enemy. The need for progress and victory must be weighed against the cost, and the tendency to escalate, and the need to exert superior force against the potential for excessive, engulfing destruction. One of the reasons that the equation of moral prudence and command is so important is that it unites two headings, ethics and leadership, that are sometimes treated separately. The matter of ethics is sometimes treated as if it were the icing on the leadership cake. On a college or academy campus, they are usually pursued by separate departments. There is also a culture gap between the ethicists and the exponents of leadership, with the former usually more academic and the latter more hands-on and applied. The identification of command with moral prudence gives those who respectively specialize in leadership and ethics a bridge between the two disciplines. At the service academies, most of the leadership instructors are military types, while the ethicists are more likely to be civilians. If command is indeed a form of moral prudence, then questions of military leadership and ethics are inextricable, and a complete understanding of either requires a grasp of both. Maybe the heads of ROTC departments should be renamed from Professor of Naval/Military/Aerospace Science to Professors of Prudence! Every now and then, a midshipman at the U.S. Merchant Marine Academy (my employer for fifteen years), thinking that he'd hit on a brilliant idea, would tell me, "You know, sir, Hitler was really a great leader!" I would generally start off by saying that, just going by the record, Hitler had not performed very well. Twelve years into his reign, German armies were defeated, German cities were in ruins, and Germany itself was covered in a special kind of shame from which it may never fully recover. Beyond this, I might say, a proper definition of leadership, certainly one which we were capable of embracing at a service academy, entirely excluded Hitler and his actions, which should be classed under tyranny, or demagoguery, as not just vexed leadership but really the opposite of leadership. Leadership brings people forward, towards the better angels of their nature (to paraphrase Lincoln’s First Inaugural Address). It cannot appeal to the worst in us, to our resentments, prejudice, or lust for power over others, tendencies that lie dormant in all, and that only need the right spark to consume us and our public lives. A leader who is incapable of moral reason, or who is indifferent to moral issues, or who lacks moral courage, isn't a leader at all, but a tyrant and despot. He is the enemy of real progress, of the common good, and such a person in a position of authority may be far more dangerous than someone who is merely incompetent. We may sometimes fall into the trap of thinking that if someone is technically competent, or if we agree with him on issues, if she has made an effort to reach out to us, if we see some of ourselves in this person (if perhaps not our better self), then this should make up for even serious shortcomings in what I've called moral prudence. This is a dangerous path. Employers and teachers are coming to realize that this kind of thinking puts the cart before the horse. Officers need not be saints, but they must be people who are willing to confront the unavoidable ethical questions that are running through the decisions they make and the example that they set. An officer’s education and practical experience give her an instinct for prudence, but like other virtues that may be partly innate or existing it should be cultivated. Military officers should also teach prudence to those they instruct, lead, and advise. This is even more critical in times like these, when brinkmanship and imprudence amounting to impudence seem to be the orders of the day. Reed Bonadonna is a former infantry officer and field historian in the U.S. Marine Corps. He has a doctorate in English from Boston University and was the Director of Ethics and Character Development at the U.S. Merchant Marine Academy. His book, Soldiers and Civilization: How the Profession of Arms Thought and Fought the Modern World into Existence, was published by the Naval Institute Press in May, 2017.